L. Agaricus campestris, Psalliota campestris, MEng funges, mosserouns, musseruns, Eng As per the Royal Spanish Academy it is any eatable fungi but in common usage it refers to cultivated mushrooms in Spanish but all mushrooms in English. Wild mushrooms are commonly called setas in Spanish. It is thought that the English is derived from the Fr mousseron, which includes poisonous mushrooms as well as edible varieties. Today, the word has come to mean fungi including the stem and umbrella shaped cap. Since 10,000 BC, it is thought that mushrooms have been eaten raw, before the use of fire, and as a means of survival when hunting was poor. In Egypt only the pharaohs could eat them as they produced immortality. 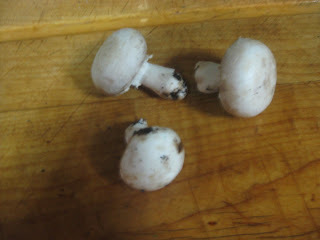 It was prohibited for commoners to consume mushrooms, as they were not godlike. Greeks thought they brought on super-human strength, while as late as the 11th C Normans gave grooms a wedding dish consisting of one pound of mushrooms for their aphrodisiac attributes. Today it is known that mushrooms contain natural antibiotics, reduce cholesterol, build up the immune system, protect the body against tumors and have a laxative effect. During the Middle Ages, they were eaten especially in English pies and pastries with grated cheese. Chickens were served in mushroom sauce. Other recipes call for larding them on a spit and roasting them. There were mushroom soups and pasties. Mushrooms were used are garnish. Prepare chicken broth. If using this recipe to make a soup 3-4 cups will be necessary. 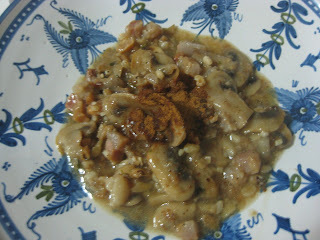 If serving mushrooms in a sauce 2 cups are enough. Scald the mushrooms in boiling water for one minute. Remove from heat, clean them and slice them. Rub salt off the pork and dice it. Heat a frying pan and add the salt pork. When the grease has melted add the mushrooms. Stir and let simmer. Put the nuts in a mortar and chop them as finely as possible with a pestle. Crumble the toast over them and pound all. Put this mixture in a pot and add the chicken broth little by little. If making soup add up to 3 cups broth. 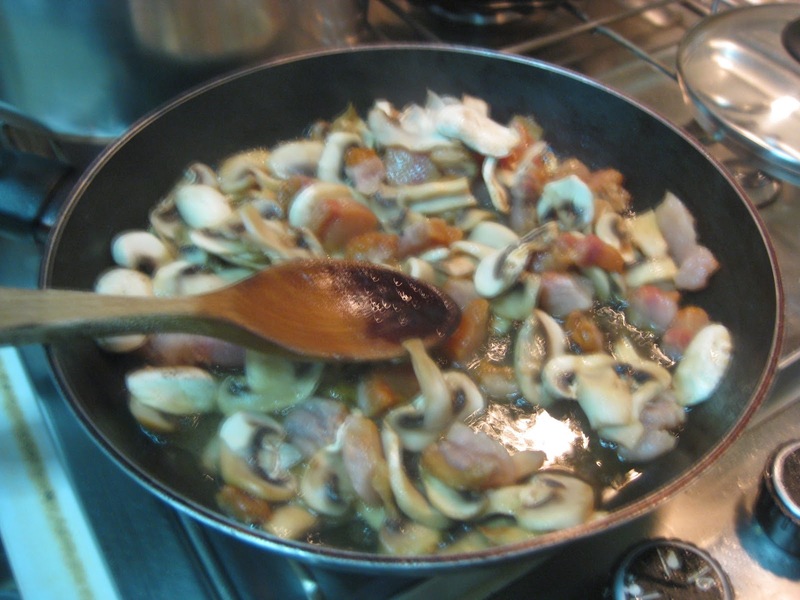 If making mushrooms in sauce add 2 cups or less. Let boil until the sauce or soup thickens. Add the mushrooms and bacon and simmer until the mushrooms are cooked. Add vinegar and the spices and mix well. Prepare soup bowls or a serving bowl if serving mushrooms in sauce. 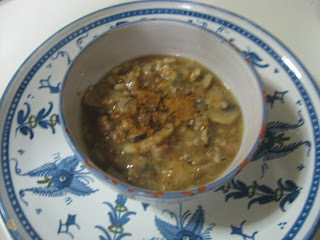 After pouring the mixture into the respective bowl(s), garnish with a mixture of cinnamon and sugar. In the Spanish medieval cookery manuscripts reviewed, no recipe for champiñones appear. As truffles are fungi they are members of the mushroom family. Because truffles are so expensive today, common mushrooms were used instead. See cardomono published August 16, 2012 for an example.